-Fast charging: iphone charger allows you to charger two mobile devices simultaneously at high speed.Save more time. -Perfect for travel: Universal lightning charger are more portable, pocket-size, compact, easier to take anywhere, ideal for international travel or business trip. -Safeguard Protection: Protects your device against over-heating, over-charging and over-current. iPhone charger Cord and wall plug come with 30 days money back guarantee and one year free replacement. Compatibility: iPhone X / 8 / 8 Plus / 7 / 7 Plus / 6S / 6S Plus / 6 / 6 Plus / 5S / 5C / 5, iPad mini / mini 2 / mini 3 / mini 4, iPad Pro / Air / Air 2,iPad (4th generation), iPod nano (7th generation) and iPod touch (5th generation). Premium Design: The Lightning Charger Cable charge much faster than most standard cables. 3-Feet & 6-Feet long iPhone charging cord, so you can use your cell phone in the bed, sofa, living room, or office. MAKE YOUR LIFE EASIER. Smart Charging: USB output 10.5W / 2.1A, and maximize the charging efficiency. enables you to charge two of your mobile devices simultaneously. Save your time. 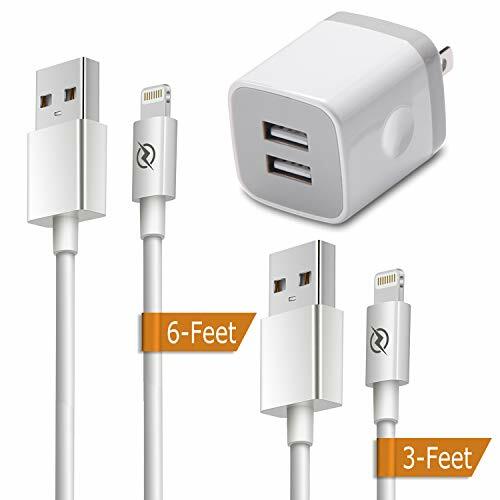 What You Get: One USB wall charger + (3ft, 6ft) 2-pack lightning cable, 1 year warranty, 24 hrs friendly customer service. If you have any questions about this product by DENWAN, contact us by completing and submitting the form below. If you are looking for a specif part number, please include it with your message.